Well, here we have another difficult one (I thought). I was dreading Caramel Making Day for most of December, which is why I didn't actually get around to it until yesterday (knowing that I couldn't today). Since I couldn't buy the frosting mix that the Almanac recommended for making the candy, I used this recipe from Smitten Kitchen, my very favourite food blogger. I had always been kind of on the fence about fruit with caramel, and then this summer at a friend's wedding, I tried an apricot caramel that changed my life. I've had dreams about it since July, wondering if there was ever a way I could make it myself, or if I would simply be doomed to make yearly trips to Saratoga, California, to stock up on their white-chocolate truffles filled with it. Luckily, these turned out just as good, and just as easy, and now I want to make them all the time. Cinnamon and Flaky Sea salt. Seriously, I don't have a candy thermometer (which is probably the main reason I hate making candy), but even without one, these are a cinch. The apple flavour shines through in a way I didn't think would be possible, and the texture is soft, creamy, and rich without being sticky or cloying. I'm taking them to work when I go back on Wednesday because the recipe makes 64 and I can't be trusted around these any longer than necessary. 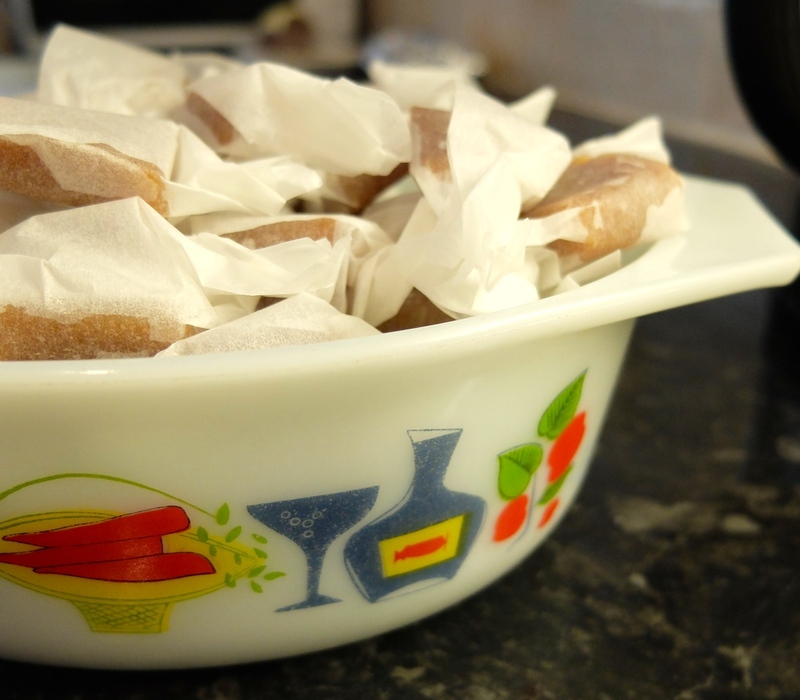 I won't kid myself and think that you'll have time to make these caramels before Christmas (or even before New Year's Eve), but if you're going to attempt one Holiday Almanac recipe, this is a good one to try on a cold and rainy January night. It'll fill your house with the smell of apples and butter, and you're friends will be so impressed with you that you might start considering candy-making as your own higher calling and quit your job to open up a candy shop. If you do, promise you'll send me some? 5 spoons out of five. (It's a Smitten Kitchen recipe, so of course it's amazing). These were super easy and super delicious, and the almanac recommends making them as part of an 'old-fashioned candy-making party,' which sounds like something I wish I would be invited to.